Koh Lipe Southern Thailand. Ko Lipe (sometimes spelled Koh Lipe) is outside of the jurisdiction of Tarutao National Park, and as such is exempt from certain laws prohibiting development. It is surrounded by uninhabited islands of the Butong Archipelago. The island is home to about 500 Chao Ley, or Sea Gypsies, who were given a grant to half of the island and live in small villages, predominantly around the far east side of the island near Sunrise Beach. The name “Ko Lipe” means “Paper Island” in the local Chao Ley language. 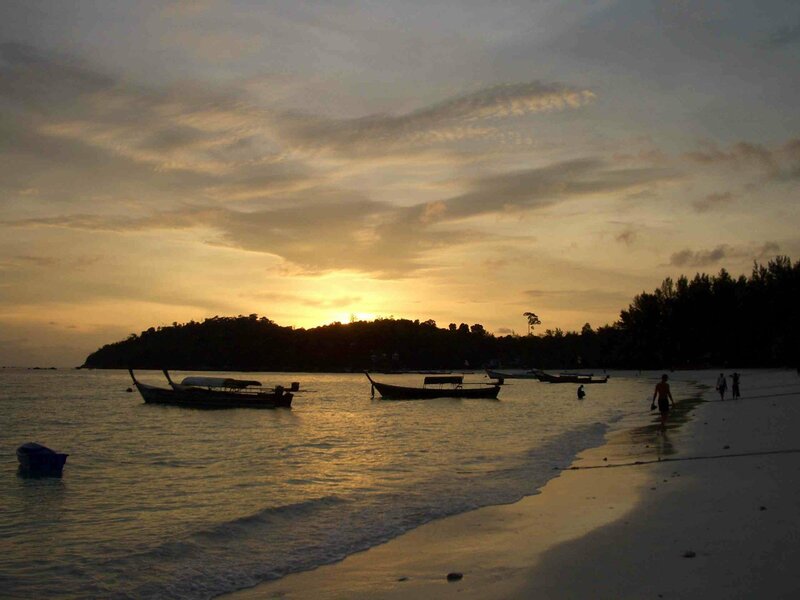 The huge tourism business of Ko Lipe results in water shortages, waste disposal issues, and other environmental problems. It is common to see garbage being burnt since there are not many reliable options for waste disposal. Ko Lipe (Thai: เกาะหลีเป๊ะ) is an island on the Andaman Coast of Southern Thailand. Ko Lipe (sometimes spelled Koh Lipe) is outside of the jurisdiction of Tarutao National Park, and as such is exempt from certain laws prohibiting development. It is surrounded by uninhabited islands of the Butong Archipelago. Nok Air offers two-daily flight+ferry services from Bangkok to Ko Lipe v.v. by flying with Nok Air to Trang and transferred on a ferry to Ko Lipe. This can be booked directly from their website. Adang Sea Tours  operates three daily speedboats from 1 November to 15 May, leaving Pak Bara at 11:30, 12:30, and 14:30. The speedboats stop at Ko Tarutao or Ko Bulone. The journey from Pak Baratakes 90 minutes and costs 650 baht one-way, 1,200 baht round trip. If you book directly in Pak Bara pier, then it will cost 500 baht plus 20 baht entrance fee. Note: the boats stops in open water pier at Pattaya beach and 70 baht must be paid for water taxi to reach the coast. The boats leave Ko Lipe at 09:00, 10:00, and 13:30 for the return trip. Bundaya Resorts  and Lipe Speedboat Company also operates speedboats from Pak Bara and Langkawi, leaving at similar times and costing the same as above. Forra Speedboats  operates two daily speedboats from 1 November to 15 May, leaving Pak Bara at 11:30 and 13:30. The speedboats stop at Ko Tarutao. The journey from Pak Bara takes 90 minutes and costs 650 baht one-way, 1,200 baht round trip. The boats leave Ko Lipe at 09:00 and 10:00 for the return trip. Satun Pakbara Speed Boat Club  operates a daily boat from Ko Lanta, leaving at 13:00 and stopping at Ko Ngai, Ko Muk, Ko Bulone, before reaching Ko Lipe at 16:00. The boat leaves Ko Lipe at 09:00 for the return trip. The company offers transfers to this boat from Phuket. The company also operates two daily speedboats from Telaga Terminal @ Telaga Harbour Marina in Langkawi, Malaysia, 42 km from Ko Lipe. These boats dock at the south end of Pattaya Beach. The boats leave Langkawi at 09:30 and 14:30 for the 60 minute journey, costing approximately 120 ringgit. The boats leave Ko Lipe for the return journey at 10:30 and 16:30. Tigerline Ferries  operates a daily speedboat to/from Hat Yao Pier in Trang, leaving Ko Lipe at 10:00 and arriving in Trang at 12:30. The trip costs 750 baht. The company offers continuing boat service to Ko Lanta (1,500 baht total, arrives 15:30), and Phi Phi (1,800 baht total, arrives 17:00). For the journey to Ko Lipe, the boats leave Phi Phi at 08:00 and arrive in Ko Lipe at 15:30. Tropical Charters  operates ferries from Koh Lipe to Langkawi (Kuah jetty) twice per day during the high season (until 19th of April 2015) at 11am and 4pm from Koh Lipe and 9.30am and 2.30pm from Langkawi. During the low season, from April 20th 2015 to the 19th of May 2015, the company only has morning trips. After the 19th of May 2015, the ferry stops running until October 2015. Price is RM118 one way (RM100 if you book online), including the longtail boat transfer and Thai custom fee. Registration 90 minutes before departure at the Bundhaya Speed Boat office located at bundhaya Resort. The trip takes 90 minutes. Arrival in Langkawi is at Jetty Point in Kuah. In the low season, there is one boat per day from Pak Bara leaving at 11:30. Ferries are met by long-tail boats offering transfers to anywhere on Ko Lipe for an additional 50 baht/person (non-negotiable). Health and Safety tip: Speedboats can often bounce off the waves at very high speeds and passengers can get quite strong jolts into the non-sprung seats, so persons with back or neck problems should not travel on the speedboats, but on the ferry. There have been reports of serious back injuries happening on the speedboats.